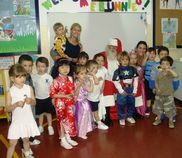 “Santa is coming!” This was heard by Pandas, Bears, Tigers, Whales, Bees, Bunnies and Puppies in the Kindergarten on their last day at school! Once again the children at Olivos welcomed Santa and greeted him with cheerful Christmas carols. They brought letters and lists for him and they were able to tell Santa their wishes for Christmas as he gave them a small treat to remember this day.